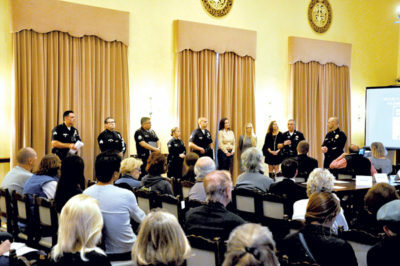 LOCAL POLICE speaking at a recent Town Hall on criminal activity in Greater Wilshire note that private patrol security is “helpful” to law enforcement as extra eyes on the streets. Property crime is on the rise, and homeowners are understandably alarmed. Reports of burglaries in otherwise quiet communities seem to come out on a daily basis. What are homeowners to do? At a Feb. 6 community meeting in Hancock Park, police Capt. Anthony Oddo from Wilshire Division said that leaders at Los Angeles Police Department (LAPD) headquarters recently have been encouraging local commanders to work more closely with private patrol services to increase “eyes on the street.” Armed patrol companies are helpful partners to the police force, explained Oddo. In decades past, when Windsor Square residents felt they needed the added protection of a private security patrol, they enlisted “Mr. James,” a security guard who would canvass the neighborhood at night on his bicycle armed with a flashlight. Longtime residents might even recall how some homes in the area had a red light installed on the top of a chimney that could be used to summon James, before the invention of the mobile telephone, obviously. Needless to say, things have changed over the years. James is gone, but there are numerous companies that offer alarm and patrol services. To provide a list of reliable providers to Chronicle readers, this reporter started by polling both residents and homeowner associations about what services are most popular in the neighborhoods. Then, I cross-referenced those recommendations with my own research to come up with a list of providers at varying price points and service levels. A major player on the Westside, ACS Security has more than 40 patrol vehicles, giving it one of the largest fleets in Los Angeles. “We have been in business for the past 36 years and provide local alarm monitoring out of our 24/7 fully-staffed monitoring and dispatch center located at the East Gate of Bel Air,” regional director Nick Falzerano told the Chronicle. According to Falzerano, ACS Security provides a full-service patrol service to the Larchmont/Hancock Park area at a cost to residents of about $100 a month. “Since we have such a large customer base, we are able to provide our customers with high quality service at a lower price point due to economy of scale,” said Falzerano. Perhaps known best as a nationwide alarm system provider, ADT also has long established roots in the neighborhood as a local patrol service. “We have been patrolling the area for well over 30 years,” said patrol manager Mike Ball, noting that he was first trained in Hancock Park back in 1985. ADT is the latest successor to WESTEC, which originally was recruited to the neighborhood by the Windsory Square Association in the early 1980s. Currently, ADT has one 24-hour patrol car in Hancock Park as well as one in Windsor Square, and they also keep one eight-hour patrol car in Brookside plus one in the Miracle Mile. For new customers, Ball suggests contacting an ADT sales representative, who will come out to your property to access your security concerns. Once your home is outfitted with an ADT alarm system, customers have two options for a patrol response. According to Ball, customers can opt for a basic alarm service response for $40; or opt for the full patrol service for $62, which includes “vacation watch” services like mail, newspaper and trash pickup. “There’s an affordable option for everyone,” said Ball. Based in Arcadia, Post Alarm Systems is a family-owned and operated full-service security company with more than 60 years of experience. Like other providers, Post offers both an alarm service and a patrol service. However, unlike some providers, Post customers do not need to be alarm subscribers to use the patrol service. According to Post’s patrol account executive Phil Peters, the company is unique in that it does not subcontract services like installation, alarm monitoring or patrol units — it’s all done in-house, with all employees required to undergo strict hiring criteria. Peters says there are different patrol options, for both individuals and homeowner associations, but for about $55 a month, customers can subscribe to the patrol service. “We put a highly visible car in the neighborhood. The officers are assertive. They talk to people, they make their presence known,” said Peters. Originated in 1990, SSA Security Group is a full-service security agency founded and fully staffed by active and former law enforcement officers. It is considered by many in the community to be the gold standard for private patrol security, with more than 420 homes in the area and nearly all of the storefronts in the Larchmont Village shopping district among its clients. In Mid-Wilshire, SSA deploys two patrol vehicles 24/7, with a third vehicle roving the area for eights hours each day. According to SSA co-founder Jerry Shaw, residents can subscribe to the company’s patrol service for $225 per month, plus a one-time subscription fee of $110, which includes a home audit risk assessment. Shaw says that his clients have direct communication with their local patrol officer, who will respond to the client’s call within five minutes, through a mobile phone number. SSA will respond to alarm activations from any monitoring service, and for clients who are out of town, the company conducts several checks of the residence each day. If for any reason you feel uneasy, the company will even accompany you to your home and check the exterior and interior for suspicious activity, Shaw explained.